Many of the works in “In Place of Now,” an exhibit at Albany’s Opalka Gallery devoted to Afrofuturism, appear to shift their form or function. Five ironing boards evoke slave ships, or maybe, tombstones. Digitally-manipulated portraits of prominent African Americans spin rapidly into mandalas or machinery. Examined closely, a woman’s braids are interwoven with traditional African symbols. Viewed from yards back, a pile of stiletto heels transforms into fierce tribal masks. “Making the heels into masks is taking ownership of them, making them powerful,” exhibit co-curator Rone Shavers, a Saint Rose English professor, said of the shoe sculptures by the renowned Willie Cole. Taking ownership of black identity is an implicit theme of the exhibit, which runs through April 14. 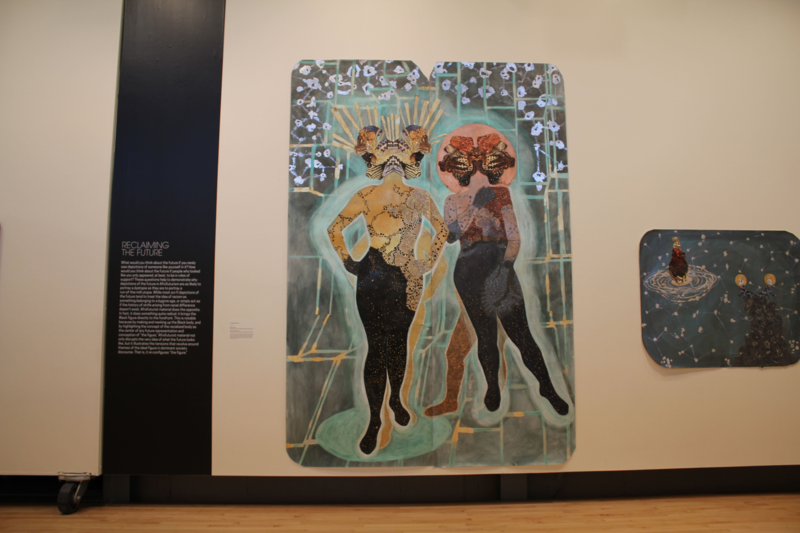 Featuring the work of eight African-American artists, “In Place of Now” showcases an emerging creative movement that has rarely been presented in the region. The exhibit is also drawing a notably more diverse local audience, and broader cross-section of scholars, than usual. “This feels very timely as race and identity are very much part of everyone’s thoughts right now,” said Judie Gilmore, Opalka Gallery director and co-curator of the exhibit. Gilmore and Shavers came up with the idea of devoting a show to Afrofuturism. But Gilmore says Shavers largely steered the project, given his expertise in history, literature, and the cultural references layered in the work. Though new, Shavers said the role of curator does not feel foreign. Born in Chicago, he became interested in ways of viewing black identity in college, and has long studied it through many disciplines. A writer of both fiction and nonfiction, he holds an M.F.A. from The New School and a Ph.D. in English from the University of Illinois at Chicago. At Saint Rose, he teaches writing and contemporary literature. Before entering academia, he wrote for several art magazines. And Shavers has followed Afrofuturism as it has taken shape since the 1990s. 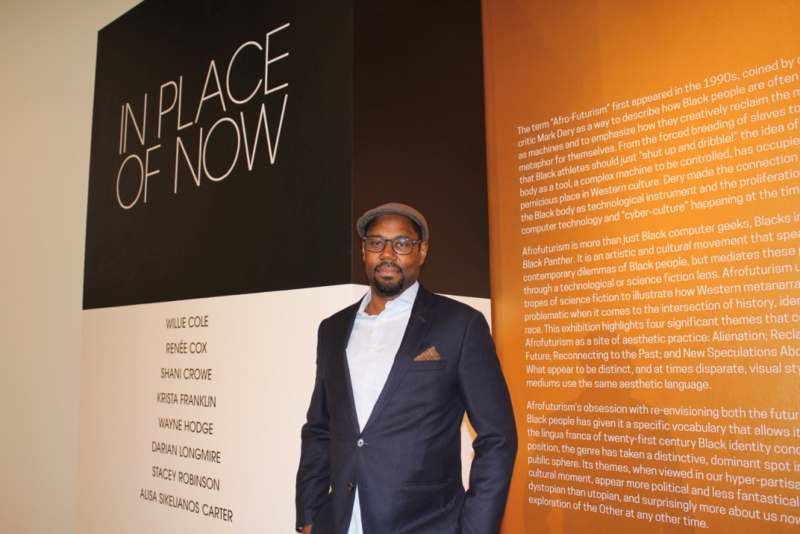 “This was a good way to combine the art and art adjacent background that I had before I became a professor,” said Shavers, who spent nine months on “In Place of Now,” helping to select the artists and writing the catalog and exhibit text. Gaining mainstream traction with the movie “Black Panther” and videos of Janelle Monae and others pop stars, Afrofuturism is a cultural and artistic movement that combines many elements to examine social positions of black people – and refute them. The past is always present in the work, Shavers notes. But so is the ability to reshape the themes going forward, often drawing from the same references. 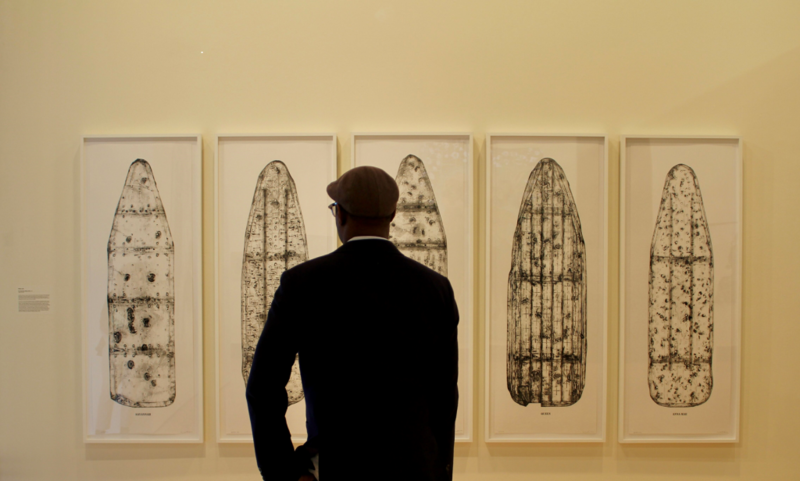 During a tour of the exhibit, he showed how the artists use common metaphors of black alienation – machinery, science fiction, the black body and hair – and re-envision them. “The black body has always been used as a machine; even if you go back to picking cotton. Think about John Henry. Think Henrietta Lacks, mass incarceration,” said Shavers, referring to ways in which African Americans have been used as objects that are put to work or experimented on. “Here, we’re talking about reclaiming black bodies, reconceiving them in a way that’s more positive and more fruitful in terms of a cultural reference,” he added. Shavers and Gilmore selected artists whose work fit themes of alienation, reclaiming the future, reconnection to the past and new speculation about identity. Among them, the Albany-born Stacey Robinson creates black sci-fi heroes who defy the erasure of blacks in mainstream sci-fi and fantasy, a Black Kirby that picks up from Marvel Comic’s Jack Kirby. Wayne Hodge’s collages pile on colors and materials that distort images of black minstrel show performers, Shaver argues, paralleling the experience of African Americans. But he sees “totemic force” in the ironing boards, or slave ships, Willie Cole calls “Five Beauties Rising Suite” and labels with women’s names. Another renowned artist, Shani Crowe, creates intricate braids that could only be made with black hair and poses the figures much like traditional portraits – subverting western beauty standards. Likewise, Alisa Sikelianos-Carter, a local artist who pays homage to the majesty of Africans and African Americans. Large and luminous, her figures have elaborate masks, what she calls “crowns,” in place of heads. 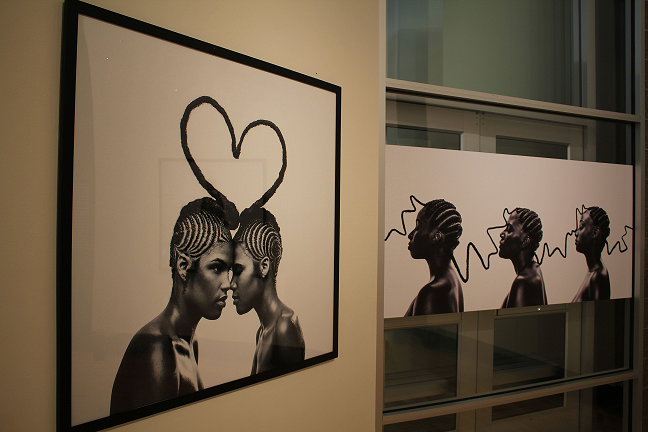 Shavers sees Sikelianos-Carter finding a new way to approach blackness, through an Afrofuturist aesthetic. These artists, ranging from world famous to emerging talent, are together for the first and perhaps last time. Shavers said his achievement is, in fact, bringing them together – and letting viewers recognize the significance. He recognizes that now all viewers will catch the symbols and double entendres.